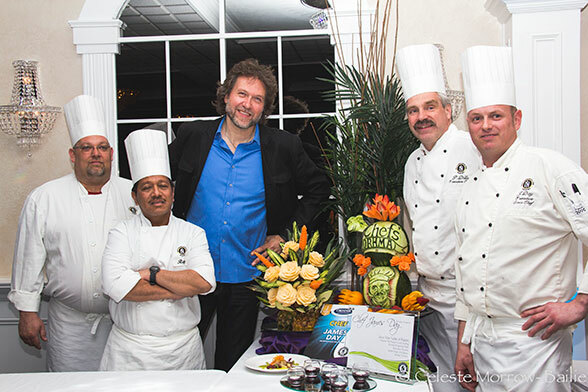 The Simcoe Hospitality Awards were off to a marvelous start with Chef Michael Smith in the house. What a wonderful and timely coincidence that Chef Smith was visiting Orillia for a fundraising dinner to benefit the food banks, and that he is a personal friend of Chef Derek Mayes, Executive Chef at the Mariposa Inn where the Third Annual Simcoe County Region ORHMA (Ontario Restaurant Hotel and Motel Association) Awards were being held. 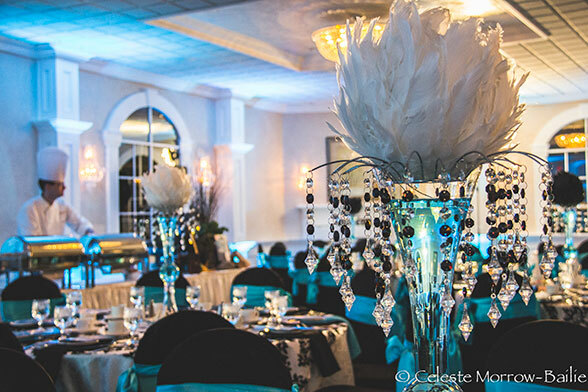 The evening is a major fundraiser in support of student scholarships for those on a career path in Culinary, Tourism, Hotel and Resort Programs at Georgian College. The industry gathers to pay homage to their own, and while the goal is to raise money, everyone from students to CEOs and guests had a wonderful time tasting and talking. 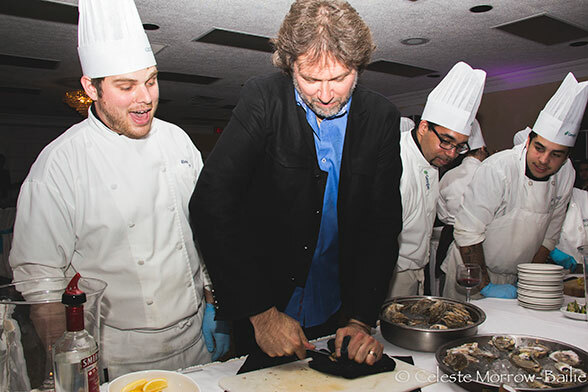 Having a Food Network star in the house, giving impromptu oyster shucking lessons, was the proverbial icing on the cake! 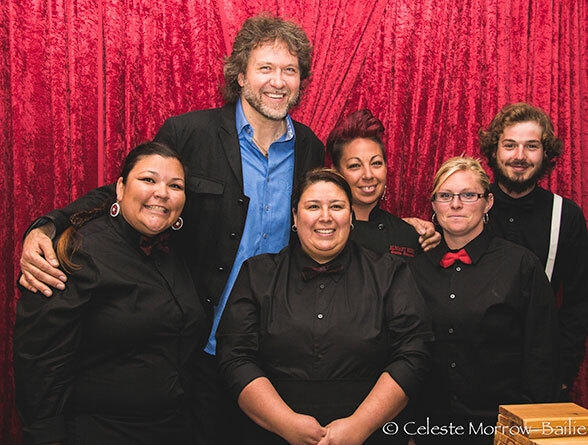 Chef Daniel Clements assured me the honoured guest was quite approachable and indeed he was. Chef Smith charmed the room, conversations and photo ops created a buzz of energy in the venue that will long be remembered. 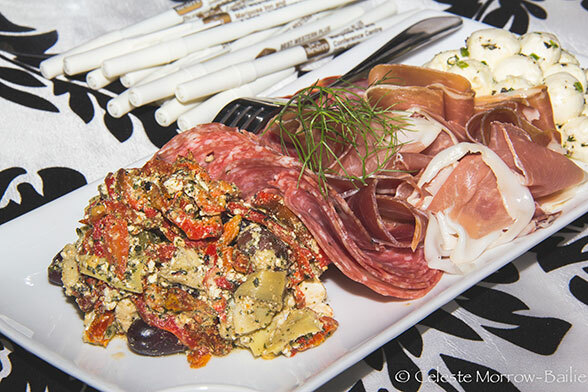 The Culinary Students created the appetizers for the cocktail portion of the evening. Ryan Traversy, a familiar name for many in the restaurant industry in Barrie, was there with Peller Estates, pouring red and white wines for our sipping pleasure. The dining room was a blast of colour, the charcuterie plate a flash of flavour, our entertaining hosts for the evening were Melanie Case and Will Nash from Rogers TV. The food stations for the Chefs nominated for the Silver Plate Award were positioned on the periphery of the room; guests, flavours and opinions mingled as we tasted the diverse dishes. Prime Angus California Strip Loin, Caramelized Onion, Aged Cheddar Potato Arrancini, Natural Glace with Currants and Truffles, Handmade Gnocchi, Sweet cherry Heirloom Tomato fennel salad. “BBQ and Bonfire” was a crowd pleaser and proved to be the winner. Presented on a hand sanded board was Slow Braised Back Rib and Frenched Chicken Drumette, twice baked mini red potato with seven year aged white cheddar, Napa cabbage slaw and Blazin’ Kraken Rum Smore. Dessert was a very rich cheesecake. I am sure I heard the sound of a collective loosening of belt buckles. Ballots and pens were on the table for guests to vote for their favourite dish for the Silver Plate Award. 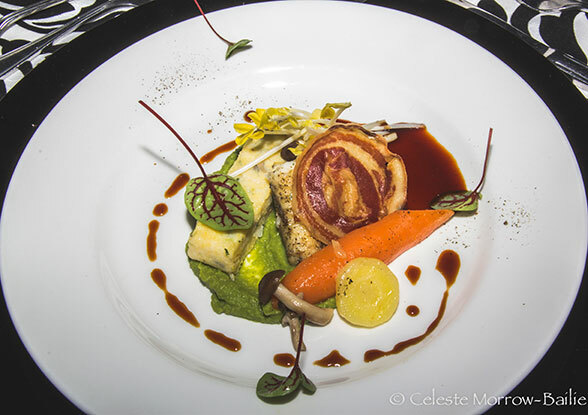 I voted for Chef John K. Cordeaux’s fish dish, it was simply delightful and in my humble opinion stood out in presentation and flavour, a spring plate personified. 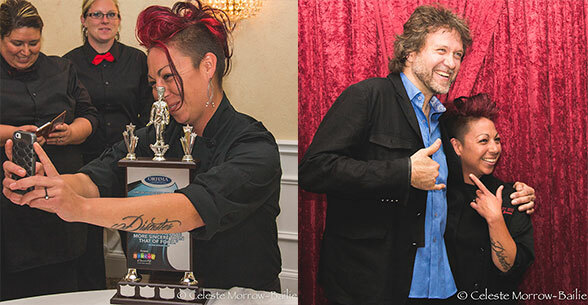 It was Chef Erika Brouwer of Elegant Edge Catering who won the Silver Plate Award; my photographer and I captured her on camera, taking a selfie with her award, grinning ear to ear, congrats! Online voting was done again this year for the majority of awards. 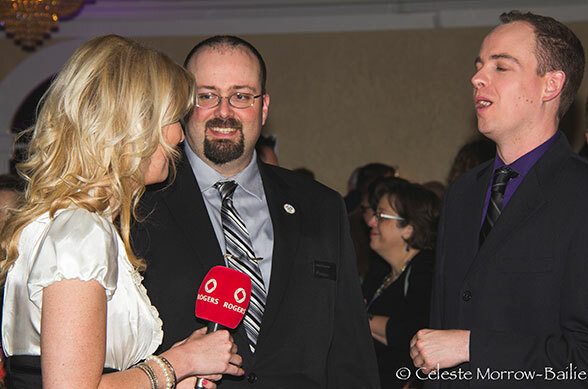 Simcoe Hospitality Awards 2015 is on Facebook and has a twitter account @SHawards2015. A tremendous job was done leading up to the event reminding their followers to vote. I am an advocate of local and for independent restaurateurs. I had hoped this would be the year Chef Andre Sanché of Ciboulette et Cie would be recognized for his outstanding support of all things local and for his kitchen mastery. Chef Michael Smith addressed the room, sharing his philosophy on what it means to be in this industry; “To gather, to prepare and to share”. He elaborated and reiterated, but the simplicity of his message summarizes why we were there. While the organization of the event and the preparation of the food took time, his six simple words said it all. We gathered as a community and shared in a wonderful evening. 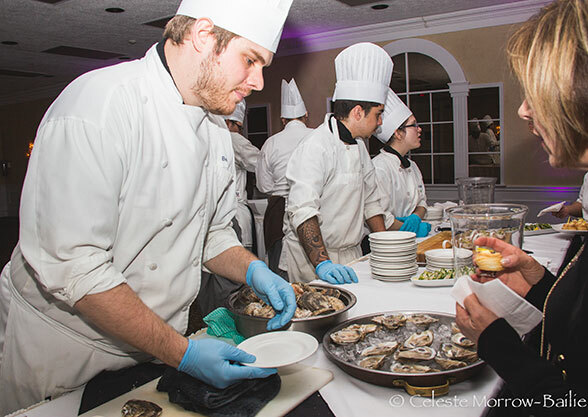 I am honoured to have attended this gala event that recognizes the extraordinary abilities in our County; the emerging talents, those that teach them, and the well-seasoned Chefs.